Five years after superstorm Sandy battered Babylon Town’s bayside parks and barrier beaches, officials there are using a drone to capture aerial videos of town properties in preparation for future storms. John Cifelli, the town’s director of operations, said the videos will expedite the town’s applications for financial assistance from the federal and state government in the event of major damage — a lesson learned during the costly cleanup after Sandy. “One of the questions that was constantly asked to me by FEMA: ‘Do you have before pictures?’ ” Cifelli said on a recent morning in Tanner Park in Copiague, where he was preparing the town’s drone for flight. “It would’ve made it a little easier for us to make our case,” he said. While the Federal Emergency Management Agency does not require local governments to keep visual records of their properties, it doesn’t discourage it either, according to agency spokesman Don Caetano. The Babylon initiative is part of the town’s ongoing revision of its Comprehensive Emergency Management Plan, Cifelli said. 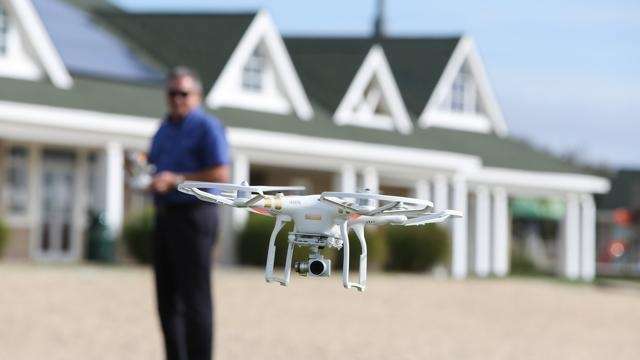 The town official said he intends to record drone footage of all town properties, beginning with its 10 or so waterfront sites, which are particularly vulnerable to storm damage. That proved true of Tanner Park, a 72-acre site on the Great South Bay that was pummeled during Sandy, according to Tony Martinez, Babylon’s deputy supervisor. Surging water tore out the park’s wooden boardwalk, washed away one pier and sent an abandoned barge careening into another, Martinez said. Waves crashed onto a synthetic turf field well inland from the natrual shoreline, and saltwater corroded the park’s electrical grid. Repairing the facilities there took months and cost nearly $2 million, Cifelli said. And that was only a fraction of the some $13 million in total damage to town properties— all of which was repaired with federal funding. With this history in mind, Cifelli sent the drone — controlled remotely and carried aloft by four whining propellers — back and forth over Tanner Park, capturing its repaired boardwalk, rebuilt piers and sandy beach facing a placid Great South Bay. Tanner Park is the first town property Cifelli captured on video, and he hopes to document the rest — including landlocked sites such as the Town Hall Annex — by the spring of 2018. “There’s nothing like a bird’s-eye view to see what you got,” he said.